From Ripples, due March 1 on Virgin EMI. Single out now on Black Koi. 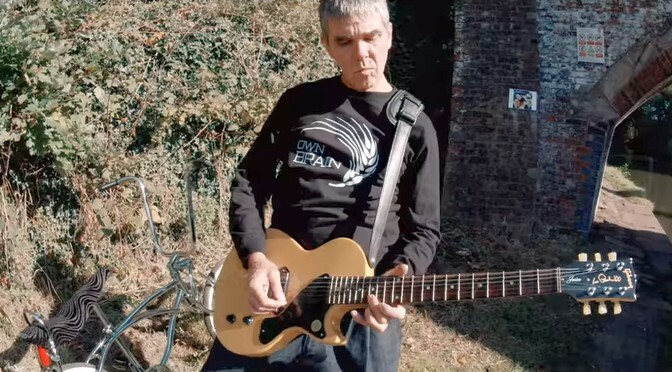 Cruising around on a low-rider bike to a clavichord-driven jam, Ian Brown stops by the riverside to occasionally noodle out the various bits of the song. First a three-note guitar solo, then the heavily Mani-like bass line, and finally a quick shot of Ian behind the kit. It all ends in dramatic fashion as Brown tosses a guitar into the river, perhaps a not-too-subtle message for John Squire? All things considered, it’s a cool song. But I can’t help wondering how it would sound with the backing of his bandmates. It seems tailor made for Squire’s wah funk guitar work, and maybe somewhere in the vaults is a version of just that? Given the unpredictability of the Roses, we may never know. Or we might? Who knows? In the meantime, go for a ride with the Monkey King and let’s hope the rest of the album is this cool. Ian Brown: web, twitter, amazon, apple, spotify, wiki.